If you have a scar that wish you could cover up, we at Clinique Matrice have a solution for you. Para-medical skin camouflage is a specialised service using professional camouflage cosmetics. With the correct application of the right productsscar para-medical skin camouflage will very effectively cover your scar for up to eighteen hours. Corrective or camouflage make up to cover scars is not something new and untested. The first corrective cosmetic products were developed during World War II by plastic surgeons in order to cover the terrible burns that fighter pilots received. Since that time corrective cover make up has been greatly improved on through continual research and testing of the products resulting in very effective makeup to cover scars. The products are now so effective that they can hide a scar a day and a half and are even waterproof. Thus you can swim or shower with no reduction in the appearance of your professional cosmetic makeup. Camouflage cosmetics include a variety of different creams and powders which can effectively conceal scars and skin discolouration for any part of the body. Physical scars can also cause emotional scars. Psychological problems are more likely to occur when a person has quite a severe disfiguration, particularly when it is on the face. This type of scar can lead to a person loosing self confidence and becoming anxious if they feel that people are starring at them. Some people can even become socially isolated and/or depressed. The emotional scarring of a physical scar can be alleviated through para-medical skin camouflage. Please do come and see us at Clinique Matrice, we have helped many, many clients who have obtained emotional scars through disfiguration caused by scars and you can be assured that your consultant will be helpful and supportive. With our help and by using professional makeup to cover scars you will soon regain confidence, reducing the emotional scars that your physical scar has caused. How Does Makeup To Cover Scars Work? Para-medical skin camouflage is the skilled application of several layers of creams specially formulated to minimise and conceal scars at the surface level. Whilst it is possible to purchase the makeup to cover scars yourself (if you have prescription from your local GP) you should first come to Clinique Matrice. We at Clinique Matrice are professional para-medical cosmetic camouflage therapists. We have the experience and knowledge to advice you which would be the best products for your particular skin type and for the scar that you wish to hide. We will also show you how to best apply the products so that you can in future undertake this yourself at home. You regain any confidence that you have lost due to your scarring. The process of camouflage colour testing can be lengthy as can be the process of teaching you to correctly apply the specific chosen products. Thus your consultation with Elaine at Clinique Matrice will be at least one hour long. It may even be that two consultations are required. Unfortunately surgery always creates scars. The size and appearance of the post surgical scar is depending upon a number of factors. This includes the size of the wound, genetics, your age, the location of the wound and your ethnicity. Thus it is not always possible for surgeons to predict the likely scaring that you will obtain from surgery. However with a trained and practised para-medical specialist the visibility of even the worst scars can be hugely reduced. Areas of your body that are more susceptible to scaring include your shoulders, chest and back. Some scars caused by surgery cannot be improved upon by cosmetic surgery. If this is your situation, your best option is to use professional makeup to cover the scar. Also after surgery it takes some months to several years for a scar to flatten and mature. During this time (and possibly after depending on how well your scar reduces with time) you can effectively cover the scar with professional corrective makeup. If you have had surgery and this has caused severe scarring, often some time after the wound has been healed cosmetic surgery can be done to improve the appearance of the scar. However there may be some time between when you have had the surgery and when you can have the cosmetic surgery done. Should this be your situation again you can obtain help from a trained para-medical skin camouflage therapist. Of course we cannot apply our services to any wound that has not healed or is still in the process of healing. 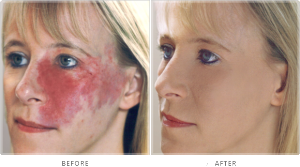 Surgical scars are always white as there is no pigment producing cells in the scar tissue. We can use professional makeup to cover this scar for you. Scars when maturing need to be protected from the sun as this can exacerbate the appearance of the scar. Fortunately, the professional products for para-medical skin camouflage contain UV protection that will shield your skin from the negative influence of the sun. If you wish us to help you to use specialised makeup to cover your scar, please call Elaine and make a time for a corrective cosmetic consultation with her. For more information about cosmetic camouflage for scars, read this article written by medically qualified doctors and researchers.